Three of the Wounded Warrior Dogs representing Belgian Malinois, the dog breed favored for recent wars in Iraq and Afghanistan, and the German Shepherd from the Vietnam war. MARYSVILLE — The dog is the “totem animal” of the human being and many difficult stories can be told and remembered through this special bond between dog and human companion. There is no stronger bond than the one forged in the stress and heat of battle where both dog and handler too often sacrifice their life, limb and mental health. That’s the sentiment of James Mellick’s exquisitely carved, grand prize winning and attendance record setting wooden memorial sculptures, Wounded Warrior Dogs Project, that are on display in the heart of Marysville at 108 N. Main Street from now through Aug. 31. The art will be displayed by appointment Monday through Wednesday, from noon to 5 p.m. Thursday through Saturday, and from 1 to 4 p.m. on Sunday. “The installation of wounded and rehabilitated dogs intends to raise awareness and focus the attention on the sacrifice and needs of wounded veterans. To this end, these sculptures are not for sale but their display is for the purpose of opening dialogue and encouraging psychological healing for veterans and families,” Mellick said. Mellick also noted he hopes to call attention to the ongoing needs of physically and psychologically wounded veterans through our bond and connection with their faithful canine companions and bring attention to the service and heroism of the military working dog. In 2016, by the vote of 400,000 visitors to ArtPrize 8 in Grand Rapids, MI, the Wounded Warrior Dogs won the largest art prize in the world. The beauty and craftsmanship of the exhibition is not intended to ignore the intensity or suffering of war. Mellick’s intent is to emphasize the nobility of those who sacrificed life, limb, and spirit in service to their country. “The long process of designing, laminating, carving, and finishing the wood means that I have to see the idea or statement worth the time and significance. I have to work with a certain sense of conviction,” said Mellick. Also in this exhibit will be the beginning of a new series “K9 War Stories” which tells the stories of soldier dog handlers and military working dogs (MWD) who have made great sacrifices for America. 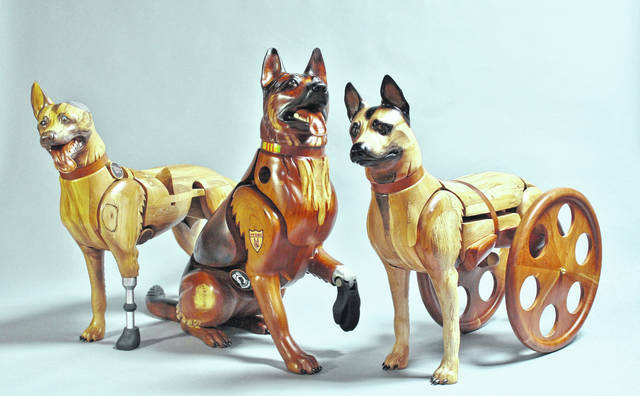 Starting in 2015, Mellick dedicated 14 months to creating the Wounded Warrior Dogs without income, funding the project by poster sales and sculpture commissions. The Wounded Warrior Dog Project has been shown at the 2015 Ohio State Fair (People’s Choice Award), The Vietnam Dog Handlers Reunion (Nashville), The Keeter Center of the College of the Ozarks and the Canton Museum of Art and featured in Ohio Magazine and The Bark. Since 2016, the dogs won the Grand Prize by the vote of the people at ArtPrize 8 in Grand Rapids and have been honored at the Ohio Craft Museum, 2017 Ohio State Fair and the Southern Ohio Museum. The dogs will be shown at the National Museum of the Marine Corps near Quantico, VA in May 2019. Mellick is an honorary member of the Vietnam Dog Handlers Association and in 2016 received a Commendation of Service from the State of Ohio Senate. The Wounded Warrior Dogs are featured on WOSU PBS, Broad & High. 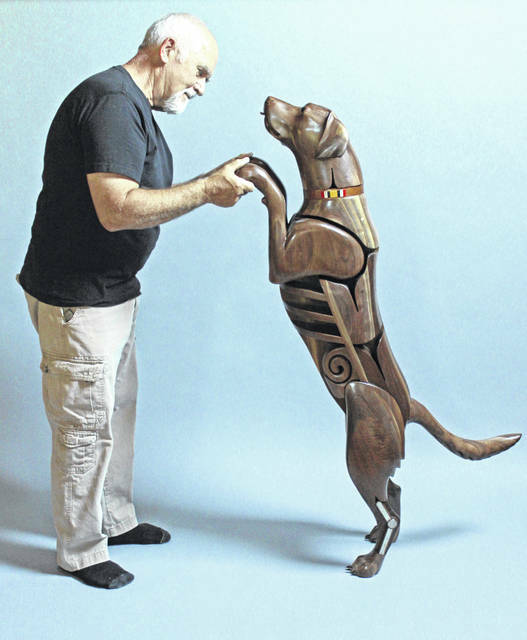 James Mellick was born in 1947, has been a wood carver since 1976 and started telling stories through dogs in 1985, He earned his Master of Fine Arts degree from Southern Illinois University at Edwardsville (1973) where he received the Graduate Award for Excellence in Art and Design. Faculty positions include Colby Sawyer College, NH, 1973-78; Houghton College, NY, 1978-81, Calvin College, MI, 1989-91 and Cedarville University, 2008 to 2014. He has also taught workshops at Penland School of Crafts, Southern Illinois University and several universities in the Ohio valley region. Mellick is a Master Ohio Craftsman and 2015 nominee for the Governor’s Award.